Naturalness of forests in Slovenia is an indicator showing the degree to which the current forest composition differs from the natural forest composition. Owing to the mountainous landscape of Slovenia and the difficult karstic terrain, many forests are difficult to access, which is why human activity in the Slovenian forests was less fatal than in most Central European countries. As a consequence, forests are relatively well-preserved, particularly with regard to the variety of natural tree species composition and (vertically as well as horizontally) the structure of stands. The changing of the naturalness of forests is a natural process which can also be partially affected by people and diverted into the desired direction. This is, like the majority of natural processes, a long-term process, and therefore difficult to observe in a short period of time. That is why the data that we have shown are not adequate to make conclusions regarding the direction of this indicator’s development. We can assume, however, that in the following decades, systematic natural forest management shall have a positive impact on the naturalness of forests in Slovenia. The naturalness of forests is an indicator showing the degree to which the current forest composition differs from the natural forest composition. The indicator is always calculated during the preparation of the Forest Management Unit Plan based on the situation in the forest sub-compartments by means of the Euclidean distance method, comparing the percentages of actual growing stock according to tree species with the natural tree composition, and taking into account the forest communities represented in the forest sub-compartment. • altered forests (above 90%). - Bončina, A., Robič, D., 1998. Ocenjevanje spremenjenosti vrstne sestave rastlinskih skupnosti [Estimation of the species composition alteration in plant communities]. - Journal of Forestry and Wood Science Vol. 57, pp. 113 –130. • Rules on the forest management and silviculture plans, Official Gazette of the Republic of Slovenia, no. 5/1998 of 23-1-1998, pp. 256 – 282. • Rules amending the Rules on forest management and silviculture plans, Official Gazette of the Republic of Slovenia, no. 70/2006 of 6-7-2006, pp. 7293-7298. - Modified natural forest: Forest / OWL of native species or naturally regenerating introduced species, where ecological processes have been disturbed by human activities, including forests established through natural and/or assisted natural regeneration. - Semi-natural forest: Forest / OWL of native species or naturally regenerating introduced species established through natural or assisted natural regeneration. - Productive plantation: Forest / OWL of introduced and in some cases also native species, established through planting or seeding, used mainly for production of wood or non-wood goods. - Protective plantation: Forest / OWL of introduced species, established through planting or seeding mainly for provision of forest services. The two methodologies are not directly comparable, and it should be noted that plantations do not count as forests in Slovenia. In 1993, the Act on Forests was passed (Official Gazette of the Republic of Slovenia, no. 30/93). Its goal is to ensure natural and multifunctional forest management in accordance with the principles of environment protection and natural values, sustainable and optimal functioning of forests as ecosystems, and realisation of their functions. The Forest Development Programme includes the national policy of natural forest management, the guidelines for the conservation and development of forests and the conditions for their exploitation and multipurpose use. • appropriate exploitation of forest sites in accordance with the natural development of forest communities. The basic condition for the realisation of these long-term goals is to improve the naturalness of forests. The changing of naturalness of forests is a long-term natural process that can be partly controlled by human intervention. Analysis of forests according to the naturalness is based on the level of alteration of tree species composition in relation to the percentage of foreign or rare tree species in a certain forest community. The (un)naturalness of forests is a result of human activity which caused the change of the natural composition. Owing to the mountainous landscape of Slovenia and the difficult karstic terrain, many forests are difficult to access, which is why human activity in the Slovenian forests was less fatal than in most Central European countries. As a consequence, forests are relatively well-preserved, particularly with regard to the variety of natural tree species composition and (vertically as well as horizontally) the structure of stands. Nowadays, the percentage of natural forests exceeds 50%, while only about one tenth of the forests are strongly changed (mostly spruce and altered forests). The most common reason for derogations from naturalness is the increase in the number of conifers at inappropriate forest sites. The degree of naturalness is related to the accessibility of woodlands, the production capacity of forest sites, the history of forests and the owners’ interest for the management of stands. Derogations from the natural state are a consequence of inappropriate management in the past. Most often, it is a result of spruce planting in the distant past (following the model of the German forest management school), especially in the Štajerska, Koroška and Gorenjska regions, and the planting of the black pine and its further spread by means of natural propagation in the Karst. The strongly changed and altered forests also include pioneer forests and shrubs. In the long term, the changed tree composition is considered as the most critical, because it often indicates reduced stability of stands. The changed tree composition is the reason for reduced resistance of Slovenian forests and consequently greater damage (especially to the conifers, such as fir and spruce) due to air pollution. The number of natural accidents that threaten a less stable forest is also increasing. A larger percentage of the black pines in the Karst coupled with drought in the summer months increase the probability of forest fires. Tree species that are inappropriate for a certain site (e.g. spruce) are under a lot of stress during the dry and warm years and are less resistant to bark beetle attacks. By means of systematically increasing the percentage of deciduous trees in spruce stands and gradual indirect changes, the condition of stands is gradually improving in view of natural forest composition. According to the FAO Global Forest Assessment, the percentage of natural forests (categories Primary and Modified natural) is much larger in Slovenia than in the rest of Europe. Thanks to the naturalness and diversity of our forests, they can be considered a valuable natural asset, important not only for the Slovenian nation but also for entire Europe. By means of natural forest management, the Slovenian forest industry is protecting and maintaining this important asset and performing an important cultural role. As mentioned above, the changing of the naturalness of forests is a long-term process, and therefore difficult to observe in a short period of time. That is why the data that we have shown are not adequate to make conclusions regarding the direction of this indicator’s development. We can assume, however, that in the following decades, systematic natural forest management shall have a positive impact on the naturalness of forests in Slovenia. We can expect the percentage of the category of strongly changed forests to reduce significantly in the following years. Our assumption is that the trend will develop towards achieving the qualitative objective. The basic method of calculating the indicator has been defined in previous chapters. Updates of the Forest Management Unit Plans take place over a ten-year cycle. When updating a specific plan, the naturalness of the tree composition is calculated for each forest sub-compartment by means of the Euclidean distance method, based on the actual ratio of tree species and the site which helps us define the natural tree composition. Because of the gradual renewal of forest management plans, the data on the naturalness of forests in Slovenia for each year are on average 5 years old (e.g. for 2006, the plans valid from 1997 to 2006 are used). • description of the data source: data were calculated based on the actual growing stock according to tree species acquired from permanent sample plots and the expected values of growing stock for individual sites. Manner of renewal: every 10 years for each forest management unit (233 in Slovenia). 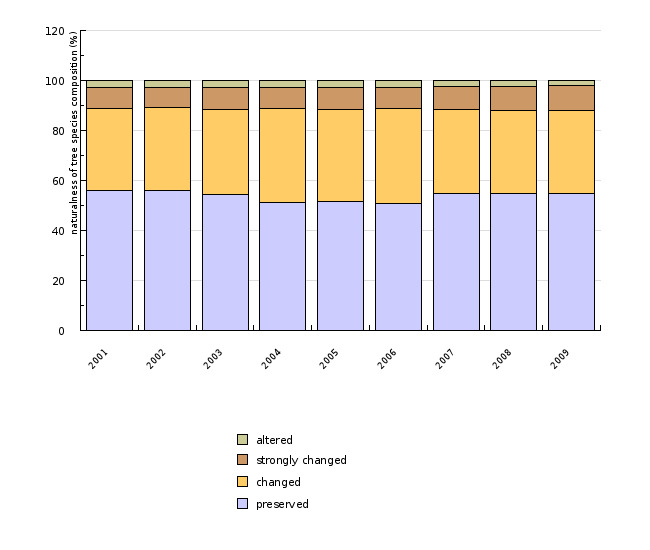 • data are shown for the period 2001 – 2008.
o Bončina, A., Robič, D., 1998. Ocenjevanje spremenjenosti vrstne sestave rastlinskih skupnosti [Estimation of the species composition alteration in plant communities]. – Journal of Forestry and Wood Science vol. 57, pp. 113 –130.